We have 33 different miniature mask designs available as brooches, bolos, necklaces, framed shadow boxes, collectibles, spirit boxes, ornaments and magnets. The masks average 2 inches by 3 inches in size. 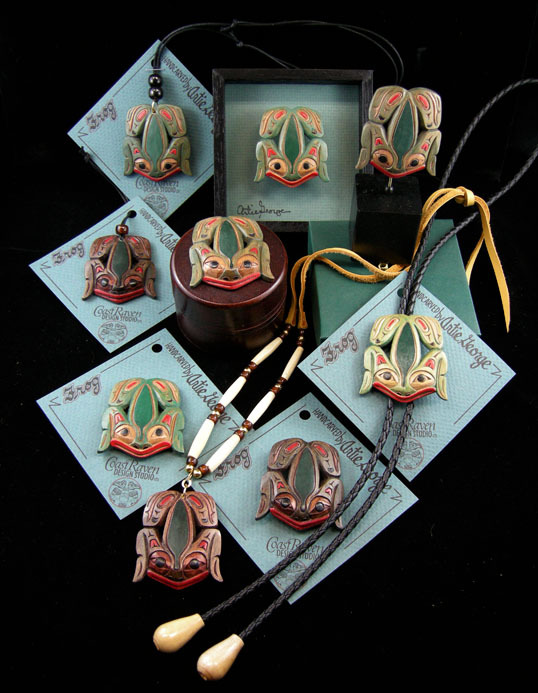 To capture the fine detail, all 33 masks are carved from yellow cedar with a variety of hand knives also designed and made by Artie. 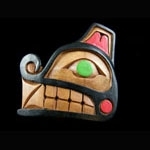 Each item is a signed original with its symbolic meaning, taken from Coast Salish mythology, included. The designs are shown below, five per page. Click the button next to the design you are interested in, to see which products that design is available in. Eagle VI - "Power, Prestige"